Our Mission is to overwhelm, delight, challenge, inspire, encourage, and strengthen one another through our work and the families we get to meet along the way. Cornerstone Photography Group is a family owned and operated business that has been providing exceptional photographic services to the South Alabama Counties, and surrounding States, for years now. Owners Ken & Rose Muse, through a God inspired venture created a multi divisional company to meet most, if not all of your photography needs. We are members of the Professional Photographers of America on a National level, continuously seeking knowledge in the world of photography. Our Studio in Mobile offers you a variety of Portrait opportunities from Classic Traditional Family Portraits, to Children’s Specialty. Our goal is to provide the utmost in personal attention to even the smallest details and your photographic desires. A combination of casual, traditional, illustrative and photojournalistic images will be capturing all the emotions and details of your studio session or your Wedding Day. Our other divisions include Cornerstone Express, Special Events, Lil Moments (School Days), Sports, Church Directories, Commercial and Fundraising are all great ways to capture those lasting memories, that you will treasure for years after the event. We have something for everyone, from the budget conscience to the extreme, you will surely find that Cornerstone will meet and exceed your needs. We would like to thank you for your business and allowing us to do what we love to do and capturing your lasting images that will be printed and enjoyed for Generations to come. 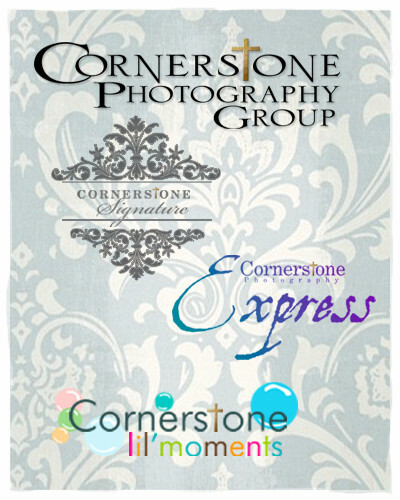 Cornerstone Photography Group Inc. retains ownership of all images and copyrights of all images. It is illegal to copy or reproduce these images without the express written permission of Cornerstone Photography Group Inc. Violators of this Federal Law will be subject to its civil and criminal penalties.